Habit: Shrub, +- erect, 30--90 cm, scabrous; dioecious. Stem: stout, many-branched, spreading, brittle. Leaf: in whorls of 4, generally 4--8(20) mm, lanceolate to needle-like, gray-green, tip sharp to touch. Inflorescence: panicle, axillary, leafy, flowers few to many. Flower: corolla rotate, +- white, hairy externally. Fruit: nutlets, < 5 mm including hairs; hairs dense, long, straight, white. Chromosomes: 2n=22,44. 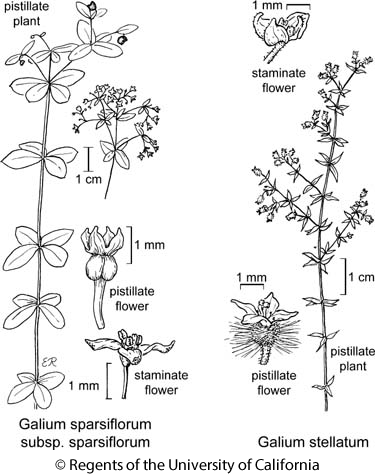 Citation for this treatment: Valerie Soza 2012, Galium stellatum, in Jepson Flora Project (eds.) Jepson eFlora, http://ucjeps.berkeley.edu/eflora/eflora_display.php?tid=26407, accessed on April 19, 2019.